Because I like to model the scenery as much as the rolling stock I made plans to detail and populate the interior of my layout. Cost became the main issue as I counted up the number of figures needed. A search of the internet came up with three lines of 1/20.3 scale figures all in the $9-15 price range. Gasp! The cost of the 60 passengers for two coaches and a combine would be more than the cars. How would I populate two entire towns? I considered using toy dwarves, cowboys and wrestlers; making my layout, look like a psychotic nightmare or creating figures from sculpty which would achieve a similar result. Imagine hundreds of clones of “Mr. Bill” riding the rails. 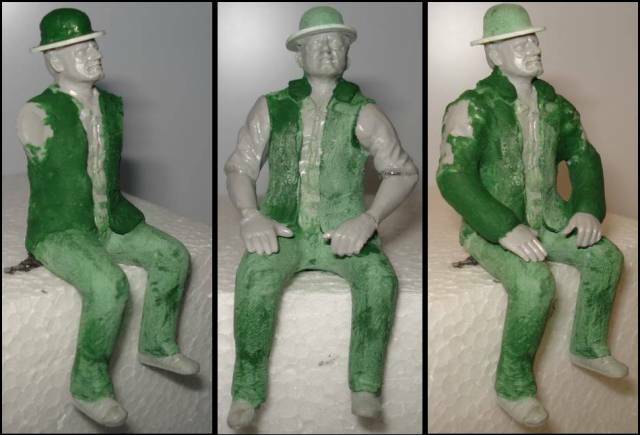 As an additional problem there is a limited number of poses available in resin. Unless I wanted a statistically improbable amount of twins and triplets I would have to alter at least 70% of them. Such repetitiveness could be overlooked in smaller scales but from 1/29 on it is noticeable and especially so in 1/20.3 where you can see facial expressions and even the whites of the eyes clearly. They are also all made from cast resin. Cutting, pinning and gluing this material is labor intensive and messy. Between the high cost, limited poses and unfriendly material this idea was at three strikes and headed for the dugout. Then quite by accident I found the solution. I lucked onto a hobby store specializing in plastic models. I bought out their entire stock of Tamiya 1/20 scale pit crew figures. Each multi-part set contains the pieces to make seven mechanics. Two are standing with the rest in various positions of crouching or bending over. With two dozen of the Tamiya sets I was ready to start production. I have been told on several occasions that following my directions is akin to having your granddad teach you how to drive his old farm tractor. Both are equally fussy but with a little patience and a small amount of cursing you eventually get where you’re going. The Tamiya figures provide a lot of advantages for this project. Since they are made for scale modelers using them as a core helps maintain proper body dimensions and a symmetrical appearance. They are styrene plastic which cuts and sands easily, it also allows reassembly using plastic model glue. 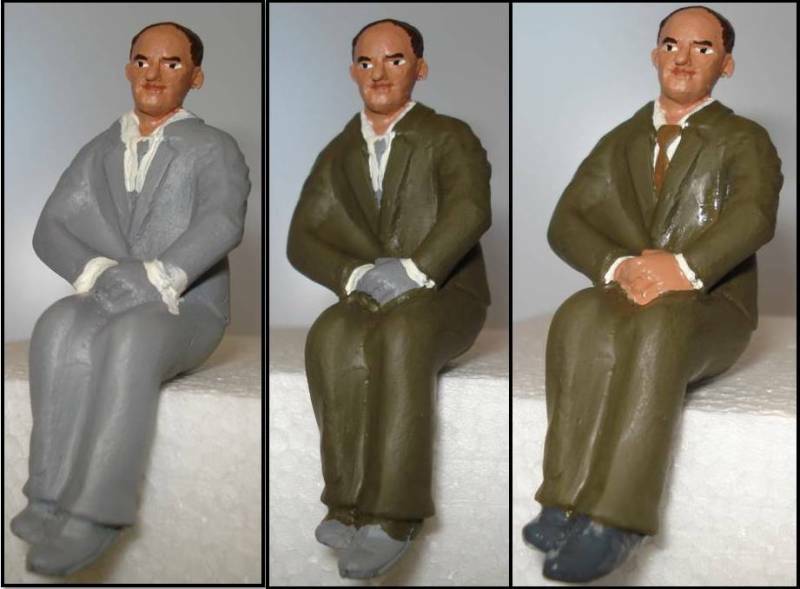 All of the heads are unique sculpts with no facial hair. Beards and mustaches can be easily added. The same applies to the clothing. Most of the figures are molded wearing short sleeve shirts and shorts. Adding pants and sleeves is simple and much easier than removing coats or other heavy clothing. My plan called for making the passengers as unique characters all of whom would be sitting. To fit the coach seats they had to be cut at the hip joints, knees and ankles. The first few were done with a razor saw but this became tedious and downright impossible for the number of cuts I needed to make. After just a few I switched to the band-saw. A little trial by fire and I had a system. I started by gluing the torso and leg sections together and let them cure for a couple of hours. This provides plenty of area for gripping the figure while cutting. Always cut the smallest pieces off first. I go in the order of: ankle, knee, top of head, neck, hips. Of course you can do it however you want provided you always have enough fingers left to drive yourself to the hospital. Pay attention to the angle of the cut. Where possible make it suitable to the new position of the adjoining parts, most often a 90 degree angle. This way only one piece per joint has to be trimmed. Moving a leg in respect to the waist leaves an open space at the buttocks. I fill this with two part epoxy plumbers putty and shape it to let the figure sit squarely. Once dry it can be sanded into shape. I use 100 grit general purpose sand-paper; it is cheap and cuts fast. 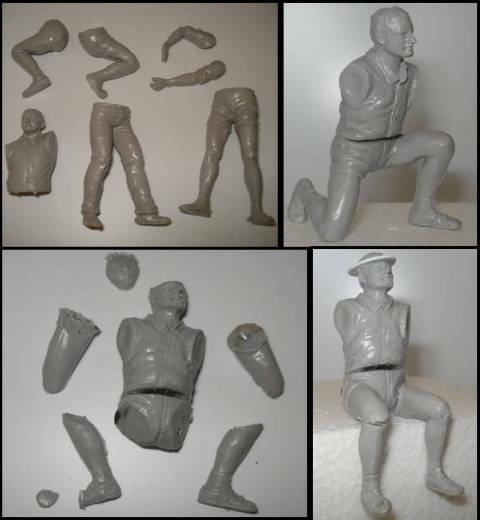 Cover the legs with modeling putty. I like Squadron Green Putty (SGP), because its texture is similar to tooth paste. It holds detail, sands well and is easily worked with a wooden coffee stir or toothpick dipped in rubbing alcohol. I recommend rubbing alcohol over acetone. It does not attack styrene plastic and the vapors won’t kill your brain cells although it may make your workspace smell like a Dr’s office. Once the leg joints are filled, pants are added by smoothing a 1/8” layer of SGP over the legs. While soft I add pants cuffs and clothing folds then leave the figure to dry over night. With the legs dry it is time to decide how the figure will be dressed. If staying with the short sleeve shirt sand the legs down first and attach the arms. I find it easier to sand the legs without the arms in place. If there will be a vest or jacket, I work on the torso first. For jackets I cut pieces of styrene for the tie and lapels then glue them on with model glue. When dry, SGP is used to build up the shirt around the lapels forming the cloth folds and closure as I go. For a vest I squeeze out some SGP onto an old ceramic tile and let it dry until it can be rolled into a long cigar shape. 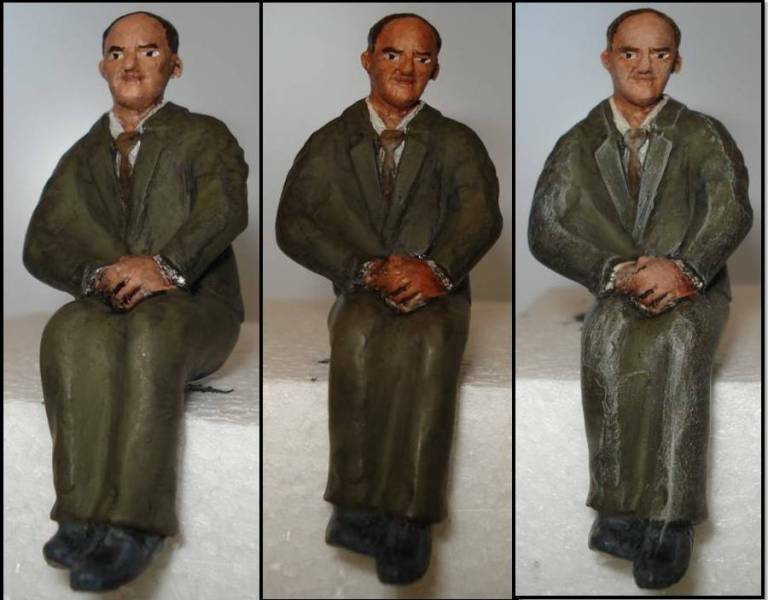 This is pressed gently on the figures chest smoothed with alcohol. I keep the closure side at a sharp angle to represent the edge of the cloth. This is done by mashing it down then pushing the edge back to where I want it. Time to let everything dry overnight again, trying to sand too soon will load the sand paper or cause the SGP to roll up in little balls. If the head was cut off to change position or for a swap it is time to put it back on. 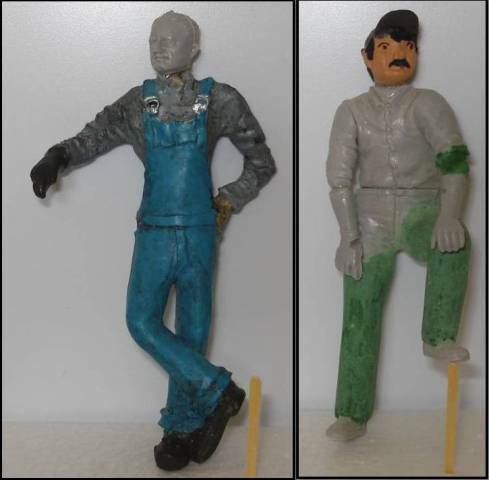 Styrene plastic heads can be glued back on but resin heads require drilling a small hole in the neck and torso, then inserting a metal pin using cyanoacrylate glue. The shirt or jacket collar may need to be built up to hide the joint. Once everything is dry I add a beard, mustache or hair as needed. I mix the SGP and alcohol on a tile until it is almost smooth enough to drip off the toothpick. Apply it to the face and in the general position and shape needed then push the edges into place. As it dries the hair texture is added using the point of a razor knife. This detail is very soft and easily damaged so I let it dry before going on. For hats an oblong disc is made from styrene and glued on top of the head. When properly centered the top of the head is attached. This gives the hat crown a firm support and helps shape it to the figures head. The crown is covered and shaped with SGP. When dry the crown and brim are shaped with a cardboard nail file. The arms are cut at the elbows and wrists as needed then glued on in their new positions. Joints are filled with SGP or long shirt sleeves or coat sleeves made with a thin layer in the same manner as the pants legs. This brings us to customizing resin figures. I do not like making major changes to this material. When working with it, I keep these things in mind. All joints must be drilled, pinned and glued. Be gentle when drilling holes. Resin is brittle and cracks easily; a simple joint change can wind up becoming a day’s long repair. Resin is hazardous; the dust is an airborne respiratory hazard and when heated from sanding, sawing or drilling resin gives off harmful fumes. Keep changes simple. 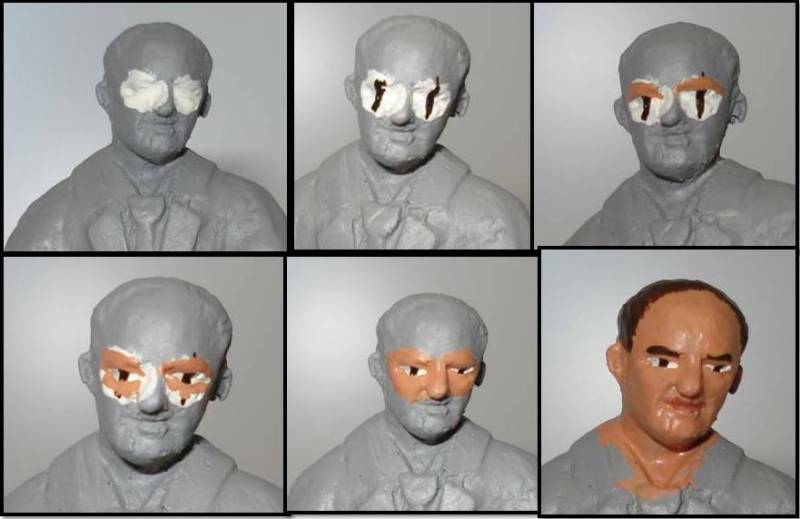 The easiest way to change the look of resin figures is to cut off the head and turn it to face a different direction. Another easy change is to swap the head onto another body. 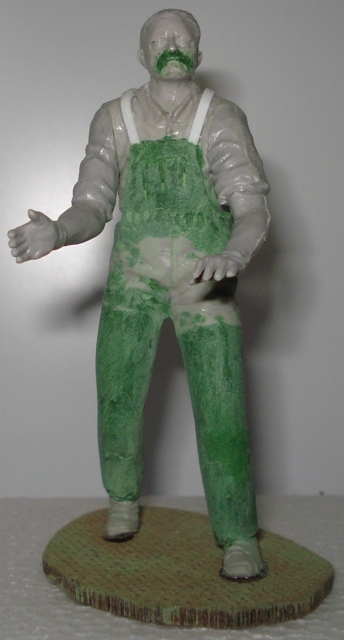 This could be a body I made from the Tamiya kit or it could be one from another resin figure. Woodland Scenics (WS) figures are well suited for head swaps onto Fn3 bodies. While most of the line is best suited for 1/24th scale some have pumpkin heads that work well for 1/20.3 and a few have the right shoulder width and torso height as well. These can be swapped at the waist. I cut off the ballerina legs and attach a set of from the Tamiya kit. These can be either of the standing pair or sitting ones I made. This will produce a well proportioned figure. To get rid of the calico look resulting from the different construction materials I fill and sand the joints finishing with a coat of spray primer. Long before I began garden railroading I learned to paint 25mm war-game miniatures. Twenty years and hundreds of figures later I have had lots of practice painting tiny details and using various techniques to mimic age and wear. What follows is a basic explanation of how to use them. In garden railroading we often apply the “10 foot rule”. With a little practice you can easily reduce that to the focal point of the eye, about 16”. Much like Grandma’s secret apple pie recipe, substitutions or deviations from the directions can dramatically change the final result. To help reduce that possibility I am going to recommend some specific products. I point them out not because I consider them superior to all others of their type but because they are consistent reliable performers. You will need a few things. To mix, thin or dry paint get an old ceramic tile, a stack of paper towels for dry brushing and a new cup and eyedropper (plastic or glass) for clean water. You will need at least three brushes: a flat ½” wide, a round 00 and a 5/0, I prefer the Masters Touch, golden taklon, series 6050 spotter. This last one is the most important; as it is used for the small details. A few comments on paint….okay a lot of comments on paint, I have strong opinions on paint. For figure painting there is nothing better than water based acrylics. If you want to try lacquers, oil based enamels, latex house paint or berry juice good luck. A good paint has two outstanding qualities. One is a durable finish. This is a result of the vehicle or carrier used and varies dramatically between manufacturers. 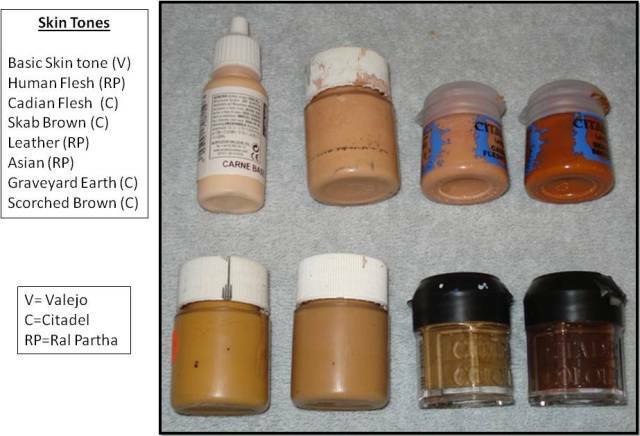 The second is pigment quality. When painting miniatures we are applying very thin coats. In order to cover and be vibrant the pigment must be finely ground and in a high ratio compared to the carrier. 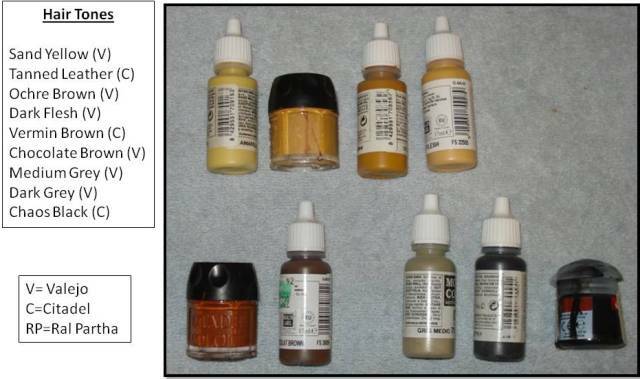 Pigment and carrier are the most expensive ingredients in paint, so you get what you pay for. Some hobby/craft brands are okay but without a doubt there is no better choice for figure painting than Vallejo and Games Workshop paints (also sold under the brand name Citadel). Both are top performers in application and durability. Both cost considerably more than those squeeze bottles from the local hobby store. The most common cause of problems with water based paints is sweat and body oils. Begin by washing your hands and all figures with a degreasing soap, I like Dawn but any dish-washing soap without moisturizers or lanolin will do. Once the figure is completely dry, glue it to a work stand such as a small wooden disc. Prime the figure using flat spray enamel. This will give the acrylics a firm surface to hold onto. I prefer light gray but if the figure has large sections of bright yellow or orange a white primer works best. I use the house brand of spray paint sold at discount stores. Do not use water based spray or brush on primers. They are thick and tend to cover detail. Start by painting the eyes. Getting them symmetrical is the hardest part of the entire project. Give yourself permission to screw up; we all do, even after years of experience. Just scrub the eye socket clean with water on a medium paint brush and wait for it to dry before starting over. If you get the eyes right in three tries you are on par. Start by painting the eye socket white, put on a big blotch and smooth it out. Switch to your 5/0 spotter for the rest of the face. Wait for the white to dry then put a thin line of black vertically through the eye socket from cheek to forehead. Put it in the center if the person is looking straight ahead or off center left or right if they are glancing sideways. The important thing is to get both lines the same width and in the same portion of both eyes. Once dry paint the top half above each eye with flesh tone in a half arch then do the same under each eye. The eye sockets may not look even yet. Paint down both sides of the nose then round the outer ends of both eye sockets. Pick the eye with the smallest socket and make the other match it by carefully adjusting the edges with flesh tone. Work back and forth until they match when viewed from straight ahead. Because of molding variations they may not match when seen from the side. Switch to the 2/0 brush and paint flesh tone on the rest of the head. Go onto the collar of the clothing and past the hair line. If you stop at the edges small bits of primer may show through. To finish the head, paint the hair including the beard and mustache if the figure has these. Use the hair color to paint a small thin arched line at the base of the forehead for eye brows. Carefully paint the lips with a dull red or tan. Block coloring is used to paint the clothing. The goal is to get the figure’s attire painted in solid blocks of color. Let the figure dry as needed so that you can handle it without getting multi-colored fingers. A shirt might be white while the jacket a shade of brown and jeans medium blue. I start next to the neck coming down the shirt, then switch to the pants. Finish with the jacket and hat. 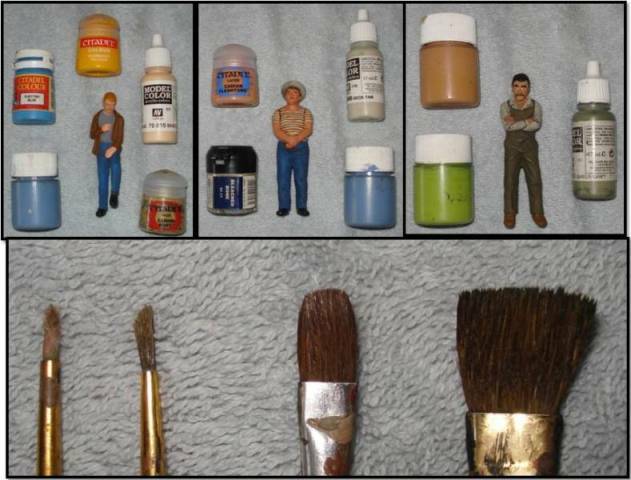 When done with the large areas change back to your small brush and paint detail items such as a neckerchief or tie, finish by painting the shoes and hands. At this point there should be no primer showing. Let your figure dry overnight. Rushing the next step can ruin the work put in so far. Now painting gets easier and faster. This technique is called “washing” and can be done with ink or paint. Hold your figure only by the work stand during this phase. It is not sealed yet and the paint can be rubbed off of details and edges protruding from the surface. If you have inks select a dark blue or black. If not thin some black paint on your tile until you can see through it. Use your large brush to cover the figure in the mixture from top to bottom until it runs off. Start with the face, brushing the wash out of the eyes so they do not become hidden. Clean your brush in clear water and dry it on a paper towel. The pigment from the wash should settle into the low areas causing them to look shaded. Hold your figure in an upright manner and brush from head to foot to eliminate any visible drips or runs. Be gentle and quick or you may scrub the paint off. The wash will darken the colors on the figure but this will lighten and fade as it dries. Leave the figure to dry overnight. By now it should start to look pretty good. For a more advanced effect using washes select a complimentary color for each section of the figure. 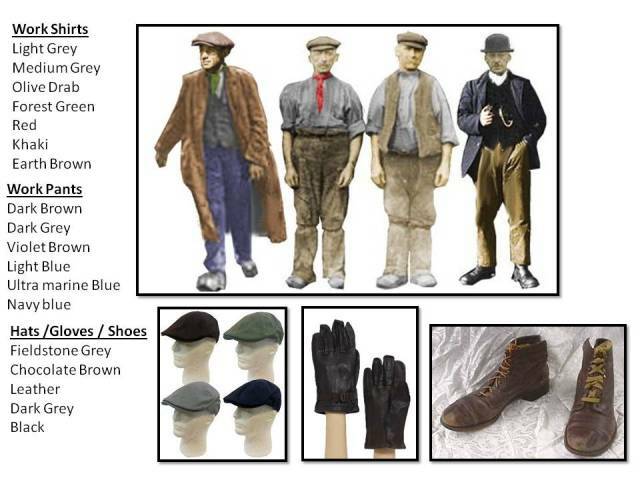 The face and hands can be done in chestnut brown or ruddy red, clothing in blue, green or brown hues and shoes and equipment in black or dark gray. Make sure you do not smear ink into adjacent parts of the figure when working it in. The last technique is dry brushing. This is hard on the brush and will destroy it for any other purpose. The good news is that as the brush deteriorates the better it is for dry brushing. You may want to set one specific brush aside for just this use in the future. Start by dry brushing the clothing. Choose a complimentary shade that is lighter than the clothing color. For light colors the original paint is best as the wash will have darkened the first coat. Put some paint on the tile and draw the brush through it until the bristles are loaded. Now drag it back and forth on the paper towels until only a light amount of paint is being left on the texture of the napkin. Whisk the brush over the clothing. A small amount of paint will be left on the raised edges and details. Gently cover the entire garment. Switch to the next color you need without washing the brush. just get as much as you can off by wiping it on the napkin. If the brush gets wet you will have to wait for it to dry before continuing. To save time a single color can be used for all of the clothing, such as light gray or a pastel blue. For hair, white will make the person look older while a lighter shade of the hair color will bring out detail. Finally dry brush the face and hands with the original flesh tone. Finish the face by dry brushing just the nose, chin and cheeks. White or light tan will give an everyday look. Light pinks and rose tones will give a sun burnt or flushed effect. For buttons and tools use metallic paints like brass or dull silver. If you have trouble getting these items to stand out try painting them black and then dry brushing on the metallic paint. Let your figure dry overnight and then seal it with three light coats of satin or matte clear sealer. I like the ones made by Krylon and Treehouse Hobbies. I do not recommend leaving figures out in the weather for long periods. Like any paint sunlight and water will eventually destroy your hard work. As a note on personnel experience I think UV sealers are useless and a waste of money. I prefer paints made for miniature and war game use. This includes Ral Partha, Citadel (also sold under the brand names Games Workshop and Marauder) and Vallejo. I have not had good luck with Testor’s Model Master line. It seems to have a lot of issues with its latex binder and creates a skin that shrinks. I have not used Tamiya or Badger but they are popular for airbrush weathering. I do not recommend the wide variety of craft paints such as Apple Barrel and Plaid. While some of these are suitable they are for the most part low quality with deficiencies in both their binder and pigment. Here is a selection of the paints I use most often for skin, hair and clothing.